Bindayı School students paid a visit to Dr. Suat Günsel University of Kyrenia Hospital due to March 14 Medicine Day. 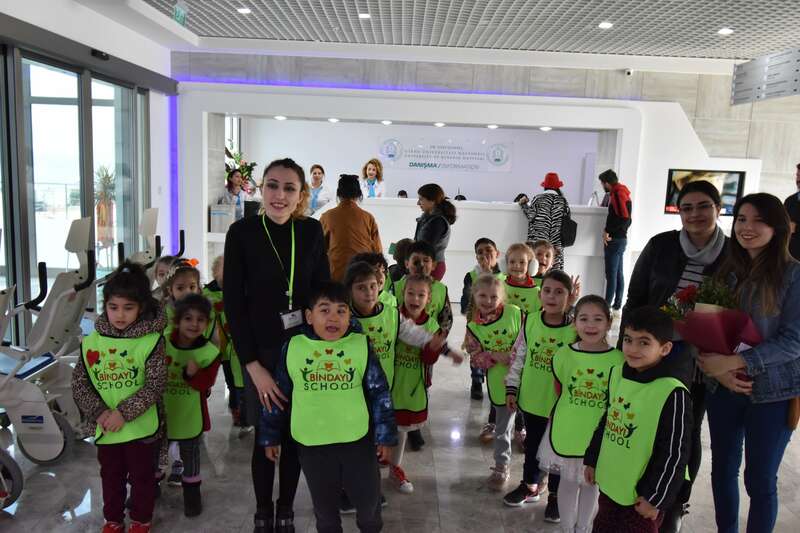 During the visit, physicians, including the Chief Physician Prof. Nail Bulakbaşı MD., and the hospital’s health and administrative staff accompanied children and their teachers. 30 children between the ages of 4-6 ages received information at the Pediatric Policlinic from Assoc. Prof. Nilüfer Galip Çelik MD., and at the Emergency Department from Emergency Medicine Specialist İpek Gülin Ağar where they also had the opportunity to observe medical instruments and ambulances closely. At the end of their visit, Bindayı School teachers and students presented flowers to Chief Physician Prof. Nail Bulakbaşı MD., and wished a happy Medical Day to all physicians and health workers. Bulakbaşı said that such visits always make them very happy and thanked the teachers and students of Bindayi School for their visit on this special day.